The Kajetanerkirche church resembling a palace on Kajetanerplatz Square in located to the opposite of the federal province′s courthouse. The most significant mark is the dome of the church, hiding the extensive abbey behind the church building as well as the attached hospital. Church and hospital are first recorded in documents from 1150. Prince Archbishop Wolf Dietrich von Raitenau purchased the building to use it for a priest seminar run by the order of the Kajetaner. The hospital was transferred to the order of the "Barmherzige Brüder" in 1923. The church is dedicated to Saint Maximilian. In its current style it was built between 1685 and 1697 through the architect Giovanni Gaspare Zucalli, who also built the parish church of Nonntal. The central building spans over three floors and is embraced by two side wings, which are all merged in the front façade. The front also displays ionic pillars. The interior hall of the Kajetanerkirche is oval and met by four crossing side-chapels. The choir is shaped in a crescent. Note the fresco in the dome by Paul Troger, which displays Saint Kajetan being taken to heaven and which was painted between 1727 and 1735. Between the first and the second floor you can see a copy of the holy stair, the Santa Scala in Rome which is said to be taken from the palace of Pilate in Jerusalem by the mother of Emperor Constantine. Around the corner, the regional government of the province of Salzburg works (sometimes) in the Chiemseehof. Towards Nonnberg Abbey you can climb up to the Hohensalzburg Fortress from here. 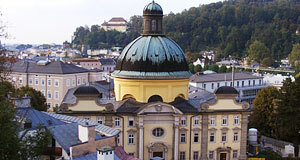 Note also the Landesgericht Salzburg, which faces the Kajetanerkirche.